The 20,850-acre Sierra Ancha Wilderness is mostly composed of pine-covered mesas that drop down almost vertical cliffs into deep box canyons. Elevations range from about 4,000' along Cherry Creek to a high point of 7,733' on Aztec Peak. The lower slopes are covered with a thick growth of chaparral that is broken up in some areas by juniper and pinon. The lowest areas are a semidesert brush and grassland. From about 1 mile north of the Honey Creek Divide (the highest point along the Desert to Tall Pines Scenic Road - which you'll probably use to get to the wilderness), Forest Road 487 heads east up the canyon of Workman Creek and after some pretty hair-raising twists and turns on the edges of sheer rock cliffs, it makes its way to the summit of Aztec Peak. The Sierra Ancha Wilderness boundary is right along that road on the south side of the summit. From the top of Aztec Peak, nearly the whole Sierra Ancha Wilderness is visible below you. In the canyons of Sierra Ancha Wilderness you'll come across many old ruins built by the Salado and Mogollon people centuries ago. Tree-ring dating of the roof beams at some sites suggest that the area was first occupied around 1280 CE and then abandoned by 1350 CE. The area has been explored but hasn't been properly excavated. Anything you find, please leave it where you found it. Group size is limited to 15 head of people and 15 head of livestock. The stay limit is 14 days in any 30-day period. This area sees most of its human traffic during big game hunting seasons. These woods have an abundance of black bear, mountain lion, coyote and mule deer. Upper photo of the Sierra Ancha Wilderness courtesy of Joe Schallan. 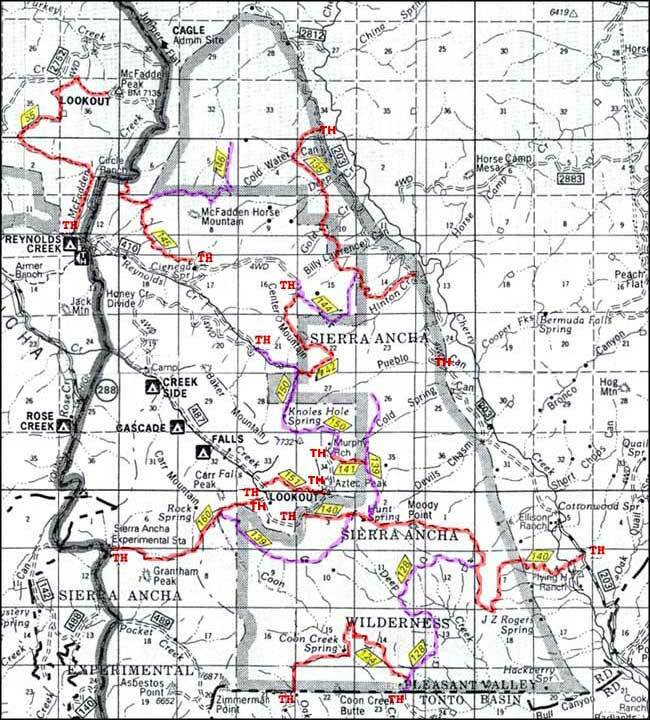 Trail map courtesy of the National Forest Service.